Continuing west down the Thruway, I stopped in Syracuse to see the Sentinel Heights tower farm. The tower on the left here doesn't exist any more; in 2001 it was WSTM (3 Syracuse), the erstwhile WSYR-TV. The tower on the right is WYYY (93.1B Syracuse), originally WSYR-FM. 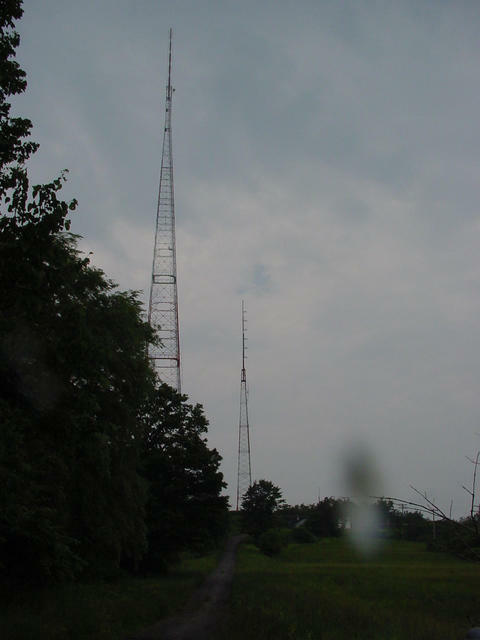 The WSTM tower was replaced in 2003 with a new candelabra for WSTM, WCNY-TV, their DTV signals, and whoever else wanted to relocate. Nobody else did. For more information about these facilities, see Scott's “A Day in Syracuse, NY (part II)” from mid-2007.